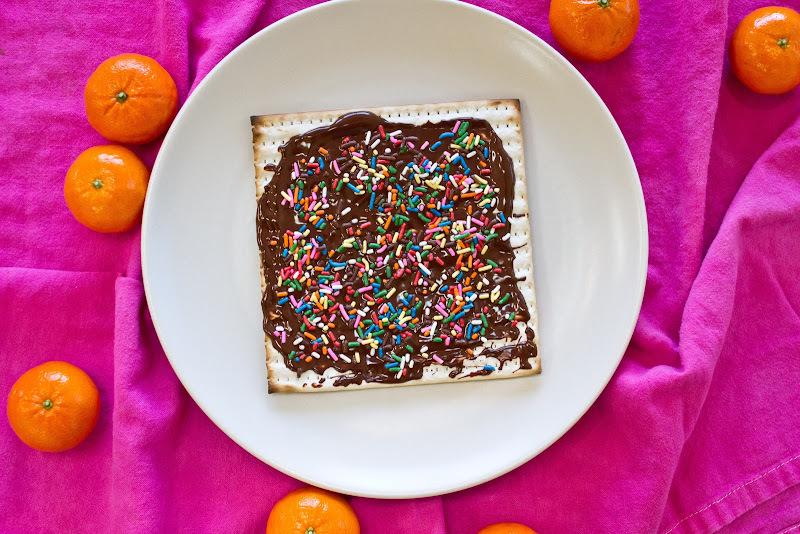 With Passover right around the corner, you're probably flipping through a variety of food magazines, thoughtfully putting together your Seder menu, right? Well, when it comes to dessert, look no further. 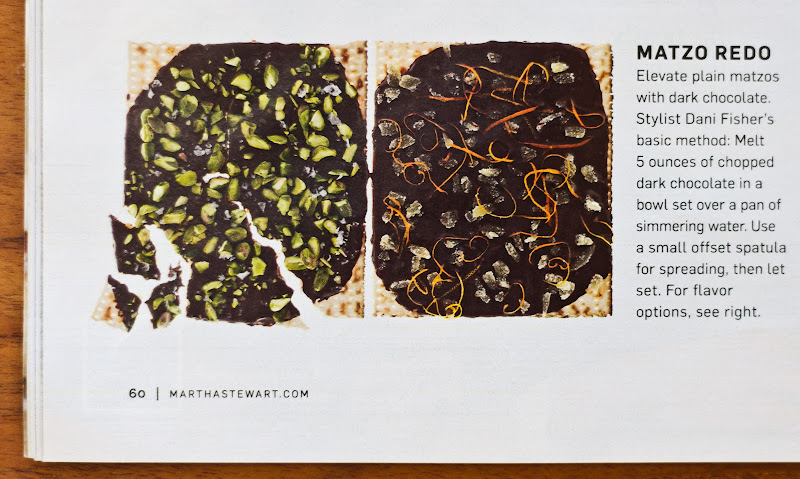 Taking inspiration from the season and uhm, elsewhere, Matt and I've come up with three different takes on the chocolate-covered matzo. You're welcome! Melt chocolate in a bowl set over a pan of simmering water. 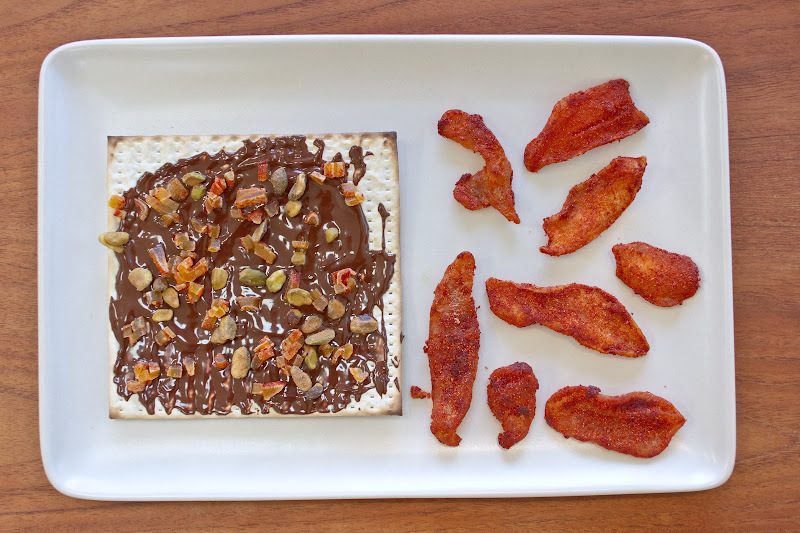 Using a small offset spatula, spread melted chocolate over matzo. Sprinkle chopped dried mango and pistachios on top. Leave at room temperature until chocolate sets up. Melt chocolate in a bowl set over a pan of simmering water. 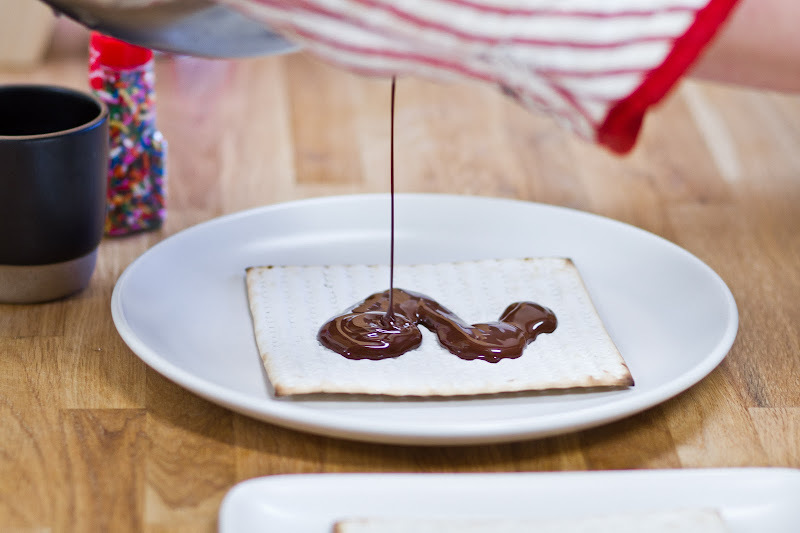 Using a small offset spatula, spread melted chocolate over matzo. Sprinkle with multi-colored sprinkles. Leave at room temperature until chocolate sets up. Melt chocolate in a bowl set over a pan of simmering water. 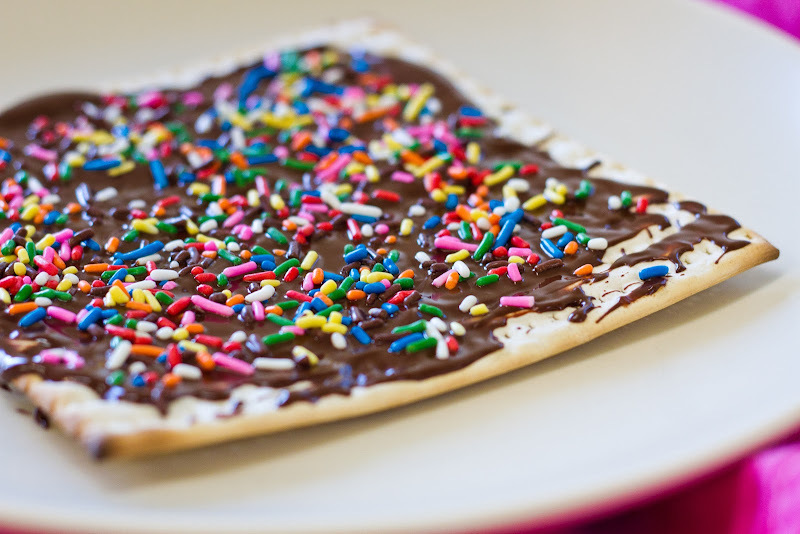 Using a small offset spatula, spread melted chocolate over matzo. Sprinkle with flowers, leaves, and rocks. Leave at room temperature until chocolate sets up. Once it's set up, wrap it in a thrifted blanket and take it to your neighbor's as a gift. Say something like, "I made this for you. Please don't eat it." Or, "I tend to see beauty in the world where others may not." Or, "You've just been kinfolked." OMG "I tend to see beauty in the world where others may not." Freaking hilarious. Also, I want to believe you are wearing a belted, linen dress. But I think it's an oxford, huh? Can't wait to try that Kinfolk version. Looks so inspiring! Because if matzo can't be an aspirational object, what can? Kinfolked! I went to a dinner party and brought my dish in Pyrex. Everyone else's was wrapped in kraft paper and tied with twine. I got KINFOLKED!! hahahah. I LOVE you for making fun of Kinfolk. And I just noticed that my comment on your sundae/book post didn't appear for some reason (probably due to my stupid work gmail that sometimes interferes with my regular account on blogger). ANYWAY. I am so happy for you, lady! And I simply can not wait to read your book. Congratulations! I've been searching for ways to use my locally-quarried rocks for ages. This recipe comes just in time! Finally!!!!!!! If normal keyboards had emojis, I would give this post a thumbs-up. Haha, I love the "do not eat this" one. So funny. I never have had matzo! I second the kinfolk dinner in the backyard thing. Make sure everyone wears flannel shirts and brings their food in kraft paper. It'll be so cool pleasedoitpleasepleasepleaseeee? Nail in the coffin. Hat on the hatchet. ITS CONFIRMED: You are awesome. ha!! Did I talk to you about the pile of leaves example? BUT, here's the thing: if you gave me a pile of leaves, I would *get it*. I would know that you were truly INTO those leaves and that you hadn't been tipped off to the idea from a magazine. @Tim: JUST because you included the Registered Trademark symbol for those products, I say YES. Yes, to a KInfolk Dinner in my backyard! Just give me a year to plan/ procrastinate / build up the courage?? Glad you noticed the tattoos, Tannaz! Guess who else noticed them? The UPS guy. I think he was pretty bummed (and confused) when I told him they were press-on. And I guess the dorky enthusiasm with which they would be presented would totally NOT be laid back kinfolk flannel shirt wearing cool. Mary Anne! A+ humor. Serious LOL. WOO! Awesome! Kinfolked has staying power. For serious! Youre too good! KINFOLK :D More powerful recipe: Remove all verbs. Nouns only. Flower leaf rock chocolate water blanket neighbor gift beauty world. Great work and I got to get more info from your post. Excellent stuff too!! It is just like yummy chocolate stuff. Read this post at the laundromat...laughed out loud at the laundromat. Just saw these the other day at Whole Foods!! Thank you!! Kinfolked is my new favorite word. Hi, Yummy!! Very attractive presentation and got eager to try it now. I hope that my bros are going enjoy this. I think this person writes for Kinfolk. Can I come? I will arrive by canoe! a kinfolk dinner party? sounds like a video just waiting to happen. I still don't get chocolate and chili-spice. But I'd eat a rock if it had sprinkles on it. Great work and I got aromatherapy incense to get more info from your post. Excellent stuff too!! It is just like yummy chocolate stuff. 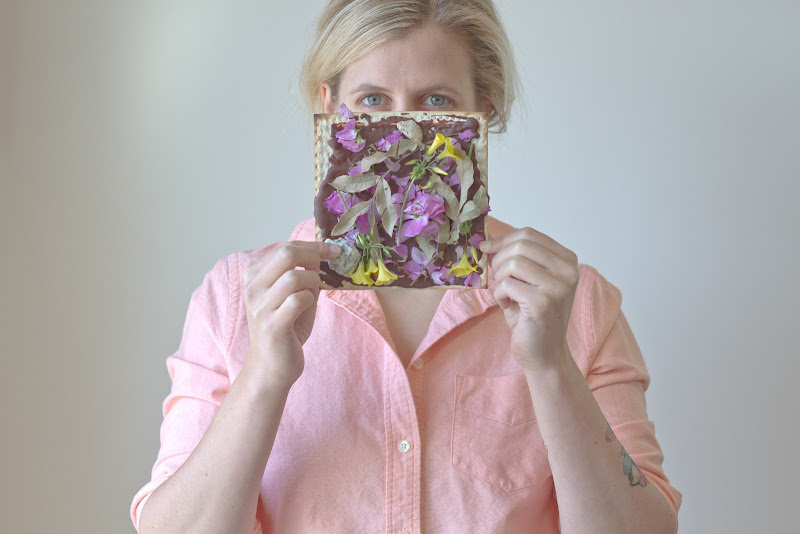 Love all the Matzo Ideas and shots! Funny! My favorite part of this post is your fake tats Amelia! I died. So funny. Your Kinfolk cover and "recipe" is genius! I just want to say, you have noooo idea how therapeutic this post is, what with Passover being, well, over and all. And that is because Kinfolk just moved into my neighborhood. Yup. The ultimate in getting Kinfolked just happened to me. I'm going to have to wrap my whole entire punk house in kraft paper. And twine. Probably the cats, too.